Last year when I was preparing to ride across the US, I decided it was time to check out the current line up of motorbike helmets and order something to replace my aging Suomy helmet. I had gotten stuck with the Suomy when my brand new Shoei was stolen in the parking lot of a Ducati dealership while on a trip to the mountains. Forced to buy a replacement on the spot, my choices were either spending $100 on a Suomy or $600+ on an Arai. Not wanting to skip meals and sleep outside for the rest of the trip, I plopped down $100 bucks, grabbed the Suomy and hit the road. 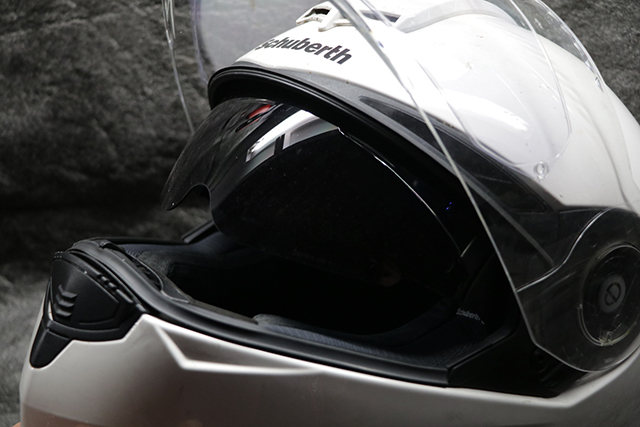 Vents at located at the chin and on top of the head allow the rider to control airflow through the helmet. 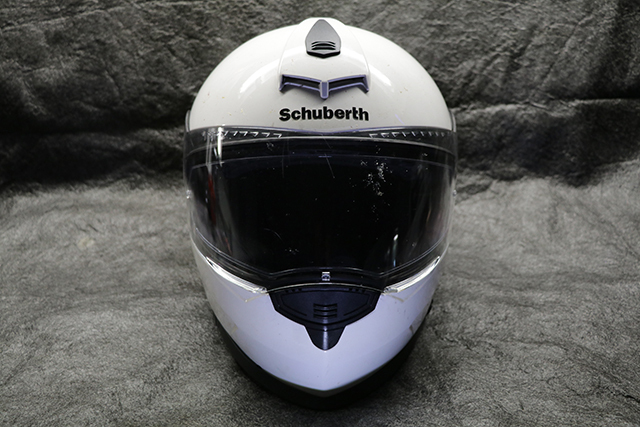 Before that mishap, I had owned a Schuberth modular helmet, which I really liked until it got run over in a parking lot (me, parking lots and helmets don't seem to mix) and decided to give their S2 model a try. It was supposed to be light, quiet and aerodynamic, which sounded like the perfect mix for riding across the country without a windshield. Warm air exits through large rear vents, providing plenty of flow and keeping your head cool. The outer shell of the S2 is made of a proprietary glass fiber and resin composite that is formed under high pressure vacuum, providing superior strength and lower weight. The interior shell uses multi-zone foaming (whatever that means) to provide optimal shock absorption and distribution. Covering the EPS foam interior is a removable and washable liner made using a combination of COOLMAX and Thermocool fabrics. The inner liner also has retroreflective material around the neck to provide increased visibility at night. Overall, I'd say the construction is top notch and most importantly passes both DOT and ECE 22.05 safety standards. The low weight was definitely a plus because even after a day of riding I never rolled into camp with a sore neck. The drop down sun screen will instantly have you humming the theme song to "Top Gun". Aerodynamically, the helmet has been designed for motorcycles in which the rider is in more of an upright position. Wind tunnel testing shows that the helmet has virtually no upward lift at both low and high speeds. In practice this means that there is little buffeting when riding without the protection of a fairing or a windshield. Although most of my riding is not what you would call high speeds (averaged about 50 mph crossing the US), I can say that I had no issues with the S2 buffeting in any wind or traffic conditions. The Pinlock system works just like a double paned glass window, using a layer of air to keep the inside surface of the visor from fogging up. Schuberth is also very proud of how quiet the S2 is at speed. Their tests show only 85dB at 100 km per hour on a naked motorcycle, which "sounds" really good. In reality, I found the S2 to be no quieter than my cheap Suomy and often times found it difficult to listen to music while riding (via earbuds) when on the highway. I have read that the addition of their communication system remedies this as it adds additional wind protection around the neck. Unfortunately that system sells for close to the price I paid for the helmet, so I will probably just stick with cheap disposable ear plugs. 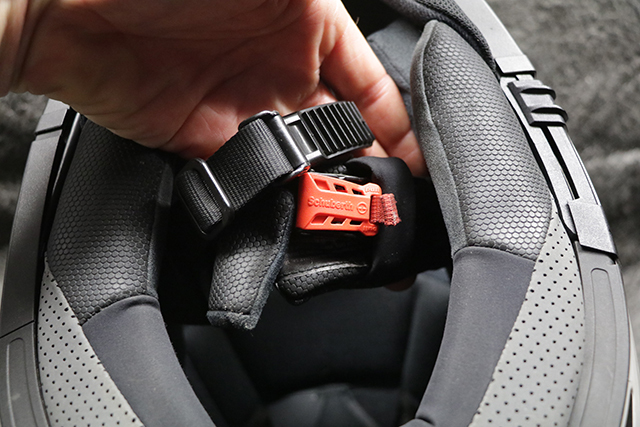 The chin strap is easily removed by pulling down on the red fabric tab located just after the Schuberth logo a on the locking mechanism. Some of the other nice features are the Pinlock visor which eliminates interior fogging. Something I really appreciate anytime I am caught in the rain or on a cool morning. It also has an integrated sun visor which slides in front of yours eyes using an easy to operate lever on the side of the helmet. This is nice because you don't have to bother with wearing sunglasses under your helmet or switching between clear and dark visors. Probably my favorite feature is the chin strap. Instead of your standard D-rings, the S2 uses a micro-lock ratchet lock. It operates similar to a car seat belt and is easy on and off, even with gloves. 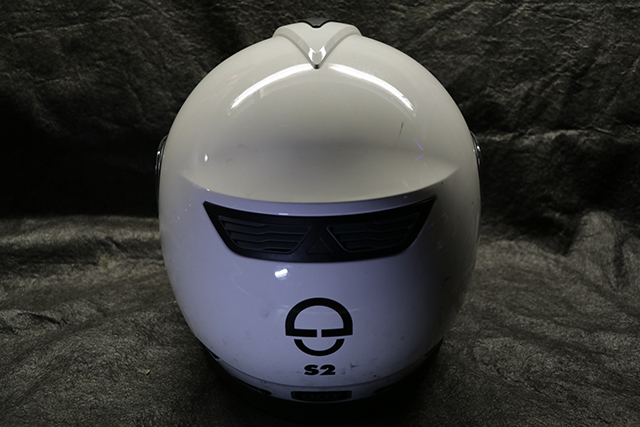 The S2 has been out for a few years, but the good news is you can often find it at much lower prices than its original retail price from online suppliers like www.motoblouz.co.uk. 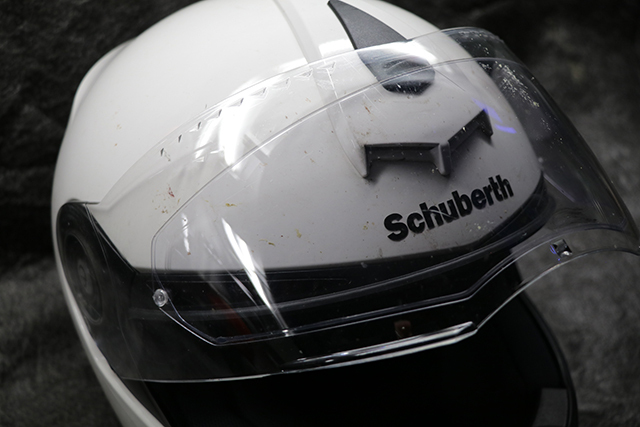 It might not be the quietest helmet I've ever tried, but if you are looking for comfort and safety, then you can't go wrong with the Schuberth S2. After a year of constant use, I'd wouldn't hesitate to buy another one, but this one has held up so well I hope to get another couple seasons out of it at least.